Pool Plastering Process | Coronado's Pool Renovations, Inc.
One of our professional Renovation Consultants will meet you at the property and inspect the pool, and make recommendations. He will then provide you with an estimate specific to your needs. You will have the opportunity to go over Plaster, tile and coping options. Your signed contract will be given to our schedule department, our schedule department will contact you to provide you with your starting date and provide additional information. If you are replacing your tile and coping, our removal team will arrive to your property and remove the tile & coping as needed. Our installation team will arrive to your property and install the tile of choice and coping. 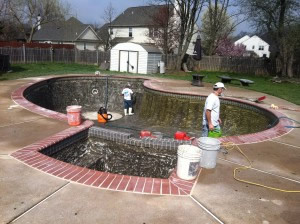 If you are re-plastering your pool, our plaster resurfacing team will arrive to your property and chip/cut as needed, inspect the pool for hollow spots and apply bonding cement to the surface if needed. Our team of plaster applicators will arrive and pump the new plaster into the pool and hand trawl until a smooth surface has been achieved. If required, our team will arrive to the property to install new self leveling caulk between the coping and expansion joint. The pool finish will start to hydrate immediately after mixing, with the majority of hydration taking place within the first 28 days. This critical time period is when a plaster finish is most susceptible to staining, scaling and discoloration. A proper start-up procedure including timely brushing and constant monitoring and adjusting of the pool water is mandatory. The following are partial recommendations taken from the National Plasterers Council. Please ask contractor for a complete list of instructions. Make sure the filtration equipment is operational. Remove all floor return heads and directional eyeballs (if appropriate and recommended in your geographical area). Based on temperature and type of finish, fill the pool to the middle of the skimmer or specified water level without interruption as rapidly as possible with clean potable water to help prevent a bowl ring. Place a clean rag on the end of the hose, always placed in the deepest area, to prevent damage to the surface material. If a water truck is required, 24 inches (60 cm) of water should be placed at the deepest area for a water cushion. Wheeled devices should not be used in the pool until after 28 days. At no time should any person or pets be allowed in the pool during the fill. Do not allow any external sources of water to enter the pool to help prevent streaking. It is recommended that you do not swim in the pool until the water is properly balanced. Step 5. Test fill water for pH, alkalinity, calcium hardness and metals. Record test results. Start the filtration system immediately when the pool is full to the middle of the skimmer or specified water level. Do not add chlorine for 48 hours. Operate filtration system continuosly for a minimum of 72 hours. Do not turn on pool heater until there is no plaster dust in the pool. Add a quality sequestering agent. Brush the entire pool surface thoroughly at least twice daily to remove all plaster dust. Make sure to adjust the PH, Alkalinity and Calcium hardness to the recommended levels. *Read your warranty, or the NPC Start Up Instructions, or ask your pool professional. 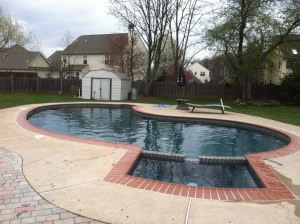 If you are looking for a contractor that cares about you understanding the process please look no further and call our office to schedule an appointment for a pool renovation professional to assist you.